Specialized Rigging and Complex Lifting Solutions Designed to Get the Job Done. An Approach Above the Competition. For large industrial rigging projects, you need a proven rigging contractor who is capable, experienced, and safe. With A&A Machinery, you can be confident you’ve got the right rigger for the job. 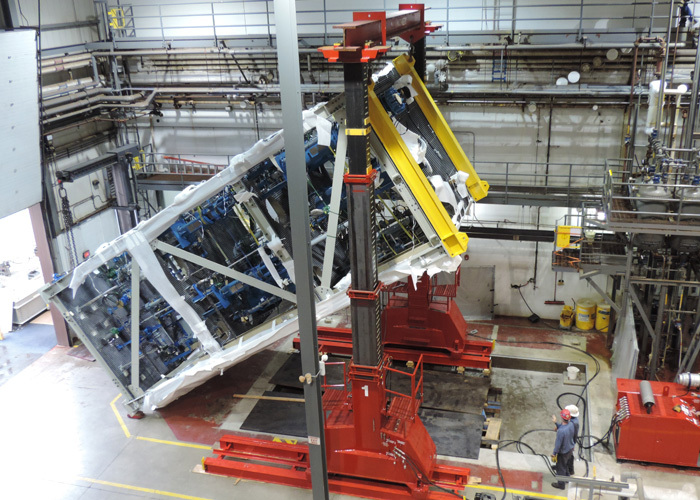 Single machines to entire plants, customers count on A&A Machinery and our strategic methods to provide the most efficient lifting and rigging solution for their projects. 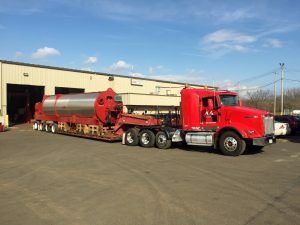 We perform and excel in heavy, industrial machinery and equipment rigging projects including our turn-key approach from disassembly, to specialized transportation, to installation. Regardless of the size, weight, or location, we get the job done right, safe, and on-time. Eliminate having to hire multiple contractors for the job. As a full-service industrial rigging contractor, we provide all the necessary riggers, machine movers, millwrights, and skilled-craft professionals to successfully complete your project. This includes all assembly, disassembly, disconnects, reconnects, heavy hauling, over-dimensional transportation, leveling, aligning, anchoring, and warehousing. If your rigging project requires relocation or removal for redeployment, we bring considerable value. Based on experience, we’ve developed proven match-marking systems and processes, providing you efficient re-installation and problem-free startups. Laying over a 100,000 lb. Verson stamping press with hydraulic gantries. Rigging and heavy lifting jobs involve dangerous maneuvers and associated high risks. Lifting and moving thousands of pounds is a specialized trade that requires precise planning and extensive knowledge. Our team takes the time to fully understand your needs and designs a project plan to get the job done safely and on-time. Our experienced riggers develop innovative solutions for an array of situations to meet every challenge that may arise. Handling large industrial machinery and equipment requires more than a standard forklift. To accompany our creative know-how to develop the best solution for your project, we’ve got a wide variety of rigging equipment in-house for any complex lifting situation. Engineered and critical crane lifts, gantry lifts to 300 Ton, heavy industrial forklifts to 100,000 lb., jack-and-slide work, unified structural jacking systems, millwright, cantilever insertions, and much more. We’re qualified through all major 3rd party agencies such as ISNetworld, Avetta, and Browz. We know how to work safely and we keep our project sites safe. Our services are designed to meet or exceed OSHA safety requirements. 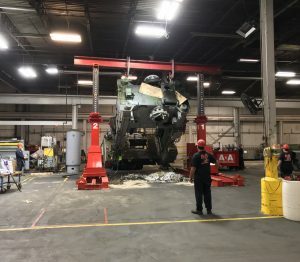 140,000 lb. cooker loaded on trailer using four 75 ton gantry posts during weekend outage. With a turn-key approach to your rigging project, we’re your strategic partner providing all transportation needs as well. Your dedicated project management team will craft specialized transportation and heavy hauling plans. Whether your oversized and over-dimensional loads are moving down the street or across state lines, our team will present specialized transportation services, resulting in savings of cost and time. Checking legal parameters set by each state, our team acquires all necessary permits and police escorts required. We’ll even perform route surveys to determine the most efficient and safest routes for your loads. When you need a proven rigging contractor with the necessary team of experienced riggers and specialized equipment, you need A&A Machinery. Rig with A&A.